It was an ecological catastrophe almost unparalleled in modern history. In 1843 a new strain of potato blight appeared on America’s eastern seaboard. By 1845 it had a foothold in Europe. When it reached Ireland, the consequences were devastating. Over a million Irish people died in a famine that caught the attention of the world. Help came from Pope Pius, the Sultan of Turkey and the Quakers. But many in government sat back, believing the crisis had been sent by God for Ireland’s improvement. Fergal Keane traces the start of the blight and its spread across Europe. The Story of Ireland (BBC One, 2011). The potato blight is first observed in Ireland by Doctor David Moore at Dublin botanical gardens. It had arrived in Belgium in June, spreading from there to France, the Netherlands, Germany and England. Reports from Ireland were initially mixed, but by mid-October it was becoming clear that a major crop failure was unavoidable. Most botanists misdiagnosed the disease, arguing that it was wet-rot induced by a particularly damp summer. The minority who attributed the blight to a fungus were ignored by the scientific community. An antidote was not discovered until over thirty years later. How is Ireland to be fed? A famine there is a calamity for which I was not prepared. After a rush to consume untainted potatoes, food prices rocketed. 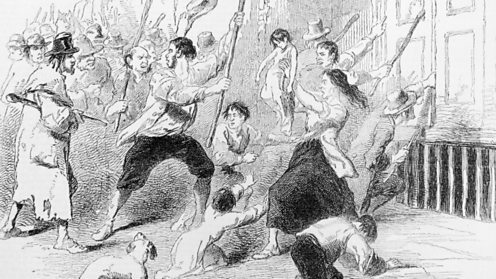 Riots broke out, like the one pictured in Dungarvan, County Waterford. A series of food and work riots push the government into starting public works employment and releasing maize purchased from America into markets. The first year of blight, while harsh, saw relatively few deaths from hunger. Prime Minister Sir Robert Peel bought in maize from America and sold it at cost price to the poor. They tolerated this ‘yellow meal’, but few found it a palatable alternative to the potato. A system of public works was designed to give employment to the destitute – but malnourished people struggled to undertake hard labour on roads and stone walls. Discontent grew. Everything depended on the next potato harvest. Despair is a passion which halts at no ordinary considerations. There is but one mode of curbing its wayward violence – let the people be fed. Fergal Keane looks at how the Whig government’s policy of minimal state intervention brought widespread misery. The Story of Ireland (BBC One, 2011). 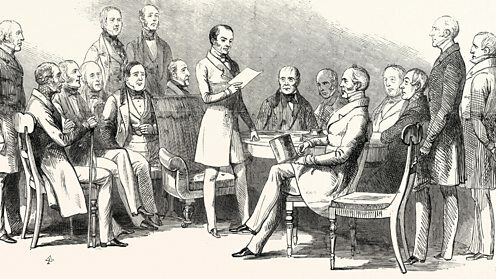 Lord John Russell forms a Whig government, following the resignation of Conservative PM Sir Robert Peel. Much is expected of the new regime. But the situation had deteriorated since last year. There was now an absolute deficit of food in Ireland and a general shortage in Europe. To make matters worse, economic hardliners in the government held sway. They objected to Ireland’s “cancer of dependency” and did not believe in providing free, or even subsidised, food to the hungry. Ireland’s grain harvest continued to be exported to Britain, and Prime Minister Russell’s early commitment to alleviate the famine proved hollow in practice. The whole credit of the Treasury and means of the country are ready to be used as it is our bounden duty to use them – to avert famine. Martha Kearney discovers how James Mahony’s sketches for the Illustrated London News went 'viral’. Great Irish Journeys (BBC One, 2015). 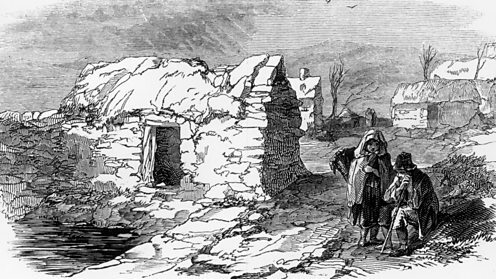 Reports and drawings from the west of Ireland appear in the Illustrated London News. The full horror of the famine is now brought to public notice. Not a single house out of 500 could boast of being free from death and fever. Ireland required major development in railway construction and land drainage. But many people were employed in building useless roads leading nowhere. Mass lay-offs from government public works schemes – before an alternative relief system has been put in place – prove disastrous. 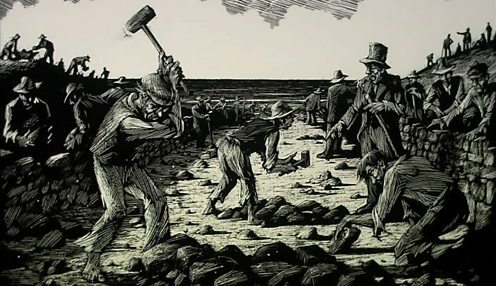 By March 1847 public works were employing some 714,000 people in such tasks as repairing roads and building walls. Many were trying to support families from their meagre earnings. 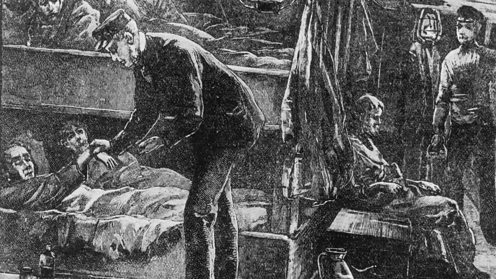 A combination of low and irregularly paid wages, ‘piece-work’ rates which penalised the least able, a harsh winter, and fever epidemics sweeping the work camps had made them a miserable failure. But the mass lay-offs from 20 March onwards left hundreds of thousands of people with no source of income. Has your lordship inquired as to whether those men have food? I fear that such a sentence would be equivalent to a sentence to starvation. Grosse Ile is a place of buried hopes for those who travelled to Canada on 'coffin ships'. The Irish Empire: The Scattering (BBC Two, 2000). The Syria is the first ship of the emigrant sailing season to arrive at Grosse Ile, the quarantine station for the port of Quebec. Out of a total of 241 Irish emigrants on the Syria, 84 had typhus fever. Nine people had already died. Panic-stricken flight from Ireland soon brought dozens more ‘coffin ships’ to the Canadian port and its facilities were overwhelmed. By the time the Grosse Ile station was closed at the end of the 1847 sailing season, over 5,300 had died there. At least another 15,000 perished soon after landing in British North America. How many died on the voyage and were buried at sea is not recorded. They would continue in the same berth with a dead person until the seamen or captain dragged out the corpse with boat-hooks. 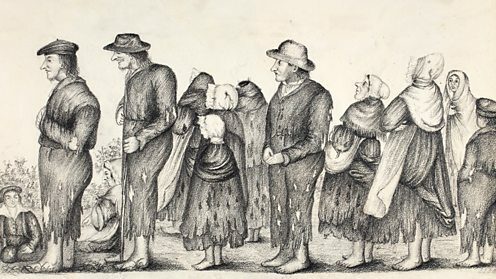 The destitute queue for food, July 1847. Government soup kitchens reach a peak of provision, feeding just over three million people with bare minimum rations. Although mandated by legislation in February 1847, a network of state-funded feeding stations was not in full operation until June of that year. These kitchens distributed cooked ‘stirabout’ (maize and rice porridge) to the destitute. In some western districts more than three quarters of the population were fed. 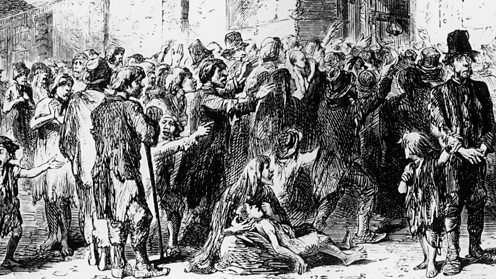 When the potato crop did not fail in the summer of 1847, the government promptly declared the famine was over. By the end of September it had closed all its soup kitchens. The temporary relief act was passed solely to replace, for one season, the food of which the people were deprived by the failure of the potato crop. 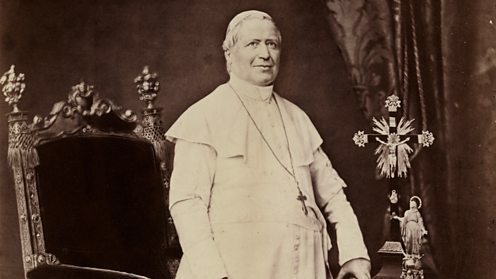 Pope Pius IX addressed the crisis of the Great Irish Famine in one of the most important papal decrees of the 19th Century. The US frigate Macedonian arrives in Cork harbour, one of two American warships loaned for transporting charitable supplies across the Atlantic. 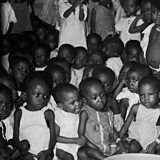 International aid reached Ireland. 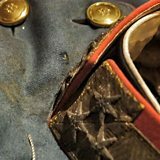 It came from American philanthropic committees, a Catholic collection instigated by Pope Pius IX, and from individuals ranging from the Sultan of Turkey to poor Irish immigrants sending ‘remittances’ home. In Britain, charitable bodies such as the British Association for Relief, and religious bodies like the Society of Friends (Quakers) were active in Irish relief. However, charitable aid started to dry up from mid-1847, even though the famine continued. The cargo consists of Indian meal, rice, beans and clothing – the contribution of New York alone amounting to the immense number of 1018 barrels! Daniel O'Connell's death in Genoa left the Irish Catholic community leaderless. The veteran Irish nationalist political leader is laid to rest in Dublin amid scenes of mass mourning. O’Connell died at Genoa on 15 May while travelling on pilgrimage to Rome. In his last speech to Parliament he had warned that without more generous relief, the government must bear responsibility for Ireland’s mortality. Lord Lieutenant Bessborough, who had also sought higher relief expenditure, died in the same month. Sadly, Irish politicians such as O’Connell and Bessborough had little influence on famine-relief policy. They were regarded with suspicion and hostility by many in Britain. The destruction of the potato crop occasioned a positive annihilation of food. Parliament was bound, then, to act not only liberally but generously. Starving peasants besieged workhouses. Fergal Keane visits the shell of one of these "mansions of the dead” for The Story of Ireland (BBC One, 2011). In the absence of other forms of relief, the starving poor now have no alternative to the much dreaded workhouses. Despite adding converted buildings, Ireland’s 130 workhouses were soon full to overflowing. Fever and dysentery outbreaks racked the desperate inhabitants. In December 1847, with the destitute poor far outnumbering the capacity of the workhouses, the authorities allowed food to be given to people ‘out of doors’. But there were harsh conditions, those deemed ‘able-bodied’ were obliged to break stones for up to 10 hours a day. Would to God you stand in our street and see with what a troop of starving creatures you would be surrounded, imploring a place in the workhouse. Desperate pleas for help from Skibbereen to Charles Trevelyan fell on deaf ears. Fergal Keane investigates for The Story of Ireland (BBC One, 2011). A pamphlet entitled ‘The Irish Crisis’ defends the government’s policy. The author is Charles Trevelyan, Assistant Secretary to the Treasury. 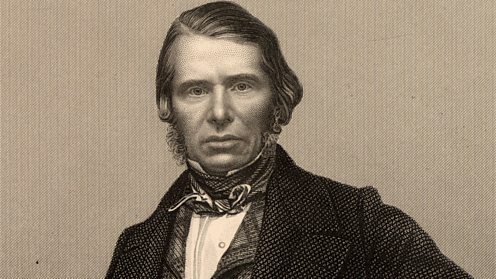 Trevelyan was the civil servant most involved in shaping the official response to the famine. He suggested, wrongly, that the crisis was over and insisted that any further “extraordinary” assistance to Ireland was unjustified and likely to prolong dependency on aid. Trevelyan saw the Irish as lazy and feckless. He sought to justify his own ideological commitment to forcing them into “self help” during a crisis he believed sent by God for Ireland’s improvement. Ireland’s regeneration is at last come. The deep root of social evil has been laid bare by a direct stroke of an all-wise and all-merciful Providence. 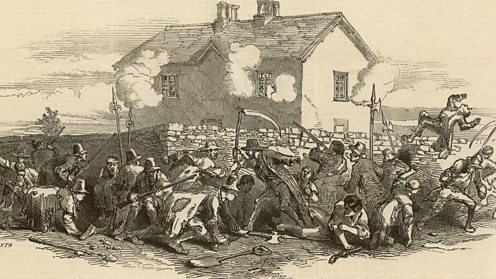 The Young Ireland rising ended in a clash between fewer than 100 poorly armed rebels and a party of police at Widow McCormack’s cabbage patch. Driven to desperation by unending famine and British repression, the radical nationalists of the ‘Young Ireland’ movement take revolutionary action. But the rebels were hampered by internal divisions, opposition from the Catholic clergy and a populace too exhausted to offer support. The attempted rising at Ballingarry in County Tipperary was a fiasco. Its leaders were arrested or fled into exile. 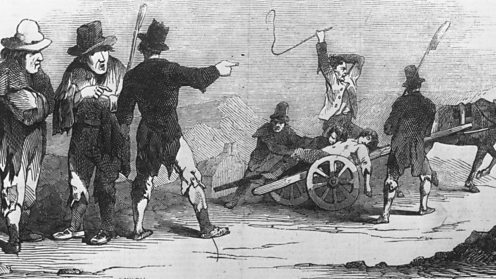 Young Ireland had failed to offer an agreed and coherent response to the Famine. Yet in later years the writings of its most radical members, John Mitchel and James Fintan Lalor, would come to shape nationalist memory of the catastrophe. When society fails to fulfill its office of providing for its people; it must take another and more effective form, or it must cease to exist. 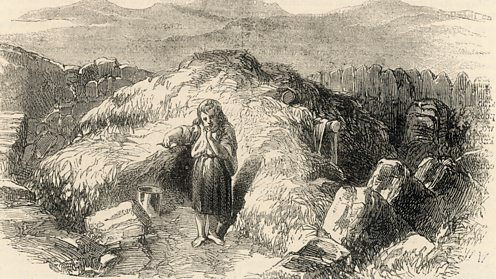 A young girl standing outside a 'scalp' – a hole dug in the earth by the destitute to create shelter. It is confirmed that at least half the potato crop has been lost to blight. Cruelly, the disease is worst in the already weakened western counties. Ireland was divided into districts called ‘poor law unions’, in which taxable inhabitants were responsible for local paupers. But many of these districts were now bankrupt, and only a trickle of public or charitable aid was available. The winter of 1848-1849 therefore saw levels of mortality and suffering as high as those of 1847. In Ennistymon, County Clare, the weekly workhouse death rate was a staggering 52 per thousand. They have been feeding more on hope than on meal and everything has depended upon the precarious potato, these people must now die in swarms. 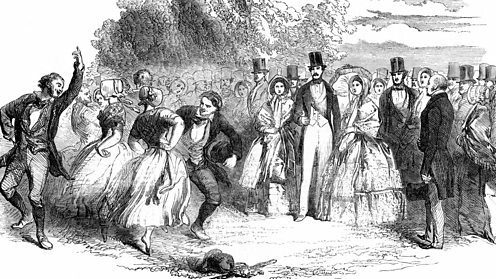 Queen Victoria and Prince Albert watch tenants dance on the lawn at Carton House, County Kildare. The Queen’s first visit to Ireland is restricted to eastern cities, where considerable funds had been spent on welcoming celebrations. The visit was intended to bolster the political union with Ireland and to promote British investment in Irish land. The Queen was personally not unpopular in Ireland, she had contributed £2,000 to Famine relief funds. But the Ireland she encountered was the recovering east, the shattered west was forgotten. She saw little of the interior of the island either – except for a short trip to the Duke of Leinster’s showpiece estate in Kildare, where selected tenants danced jigs for her amusement. The visit of Her Majesty to Ireland is calculated to produce more good than any enactments which a populace might demand or a Parliament devise. 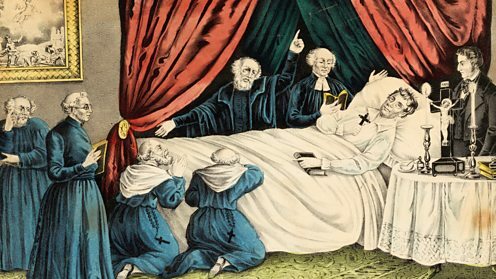 Fergal Keane discovers how a clergyman brought visitors to mass graves in Cork, before himself dying of typhus. The Story of Ireland (BBC One, 2011). 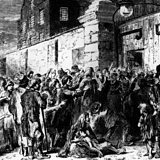 A census of Ireland reports the population to be just over 6.5 million, around 20 per cent lower than in the last census of 1841. The country has improved in wealth, and progressed in energy, since the recent calamity that seemed to threaten its very existence. President Mary Robinson said of Grosse Ile: "This is a hallowed place." 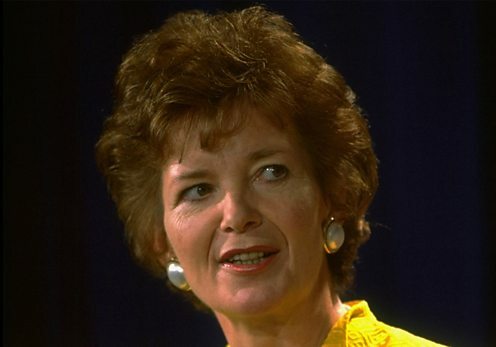 Irish President Mary Robinson visits Grosse Ile in Canada, where over 5,300 people died fleeing the Famine. President Robinson’s visit initiated a series of events to commemorate the 150th anniversary of the Great Famine. These happened in Ireland and throughout the ‘Irish Diaspora’ – locations all over the world where Irish people and their descendants live. The commemorations stressed parallels between past and present suffering. Ireland’s National Famine Museum opened that year at Strokestown, County Roscommon. The following decade saw numerous memorials unveiled across the globe. Grosse Ile is not simply a place to commemorate the past. It is a resource to connect us with the terrible realities of our current world. A statement acknowledging Britain’s responsibility for mishandling the Great Famine is issued in the name of Prime Minister Tony Blair. The statement was read at a commemorative event in County Cork. Mr Blair wrote: "The famine was a defining event in the history of Ireland and Britain. It has left deep scars.” His words were welcomed by John Bruton, the Irish Prime Minister: "While the statement confronts the past honestly, it does so in a way that heals for the future." 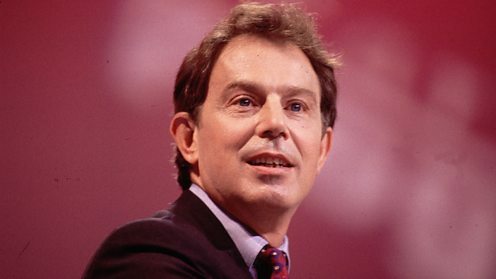 Mr Blair’s gesture was acknowledged warmly by many in Ireland as an apology for an historic wrong, but it also drew criticism from commentators in the UK. Those who governed in London at the time failed their people through standing by while a crop failure turned into a massive human tragedy. 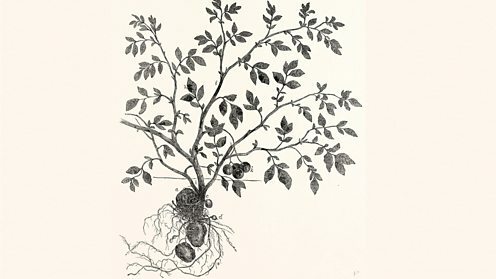 The Irish Potato Famine: Could thousands have been saved?